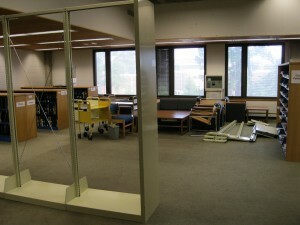 In order to prepare the first floor of the LADC for its upcoming renovation, the bound volumes of our journals are being moved upstairs. 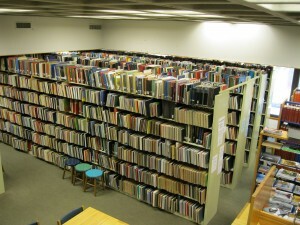 The shelves downstairs will then be removed to get our first floor ready for new carpet and new paint (and much more) this December. 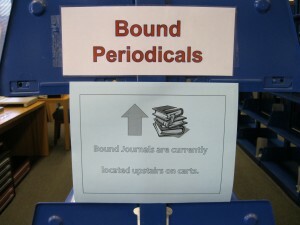 Meanwhile, bound journals will be located upstairs on carts and in boxes. 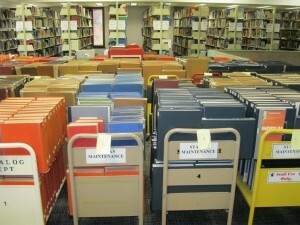 Beginning with A, journal titles were moved onto carts, taken upstairs, and lined up in rows. 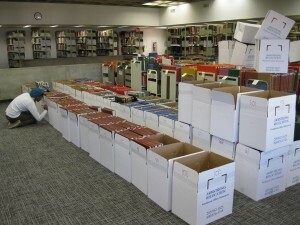 When most of the available carts were full, boxes were built, and journals are currently being moved upstairs into boxes. 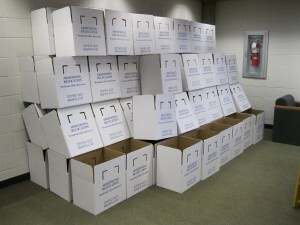 For the remainder of the semester, while journals are in this temporary location, please do not hesitate to ask us for help with the journals! 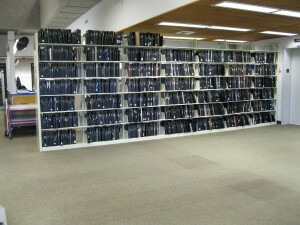 We will be happy to retrieve any journal volumes that you need. 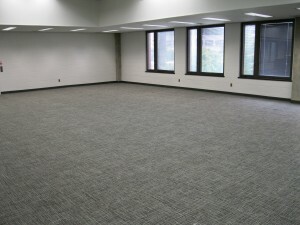 The LADC's upper level has been painted and carpeted. 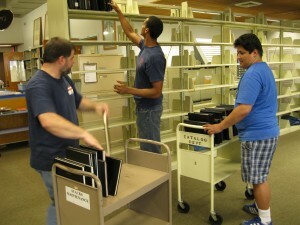 A crew from the LADC and the main library helped complete the shift of books from temporary shelving downstairs back up to their permanent location upstairs. 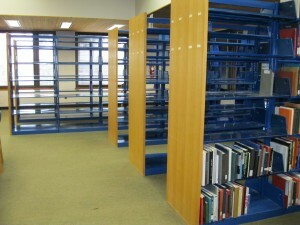 (It took two weeks of assembling shelving and moving books!) Our shelves' wooden end panels and pieces of our wooden furniture have been sent to be stripped and stained. 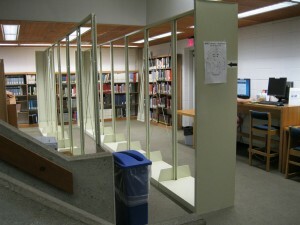 Temporary study tables and lounge furniture provide a place for quiet study and reading upstairs while we await new furniture. 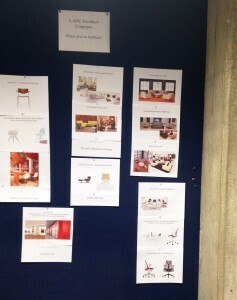 Options for new furniture have been displayed on our bulletin board so that members of the CADC and all library users may give us feedback on the choices. 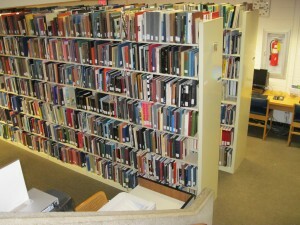 The shift of books from upstairs to the main level was completed last week. 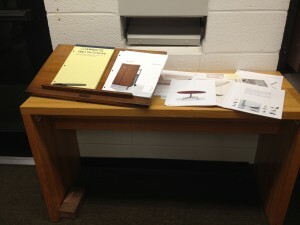 All of our regular collection, oversize collection, and portfolio collection is temporarily housed on the main level. 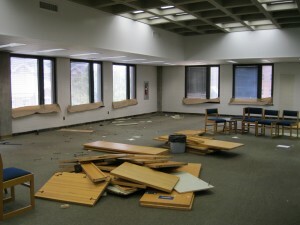 Meanwhile, the upstairs is emptied of furniture and shelving for the application of new paint and carpet. 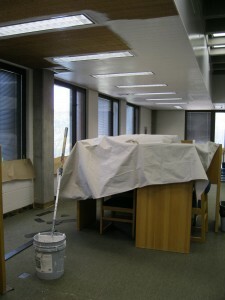 Painting began this Tuesday. 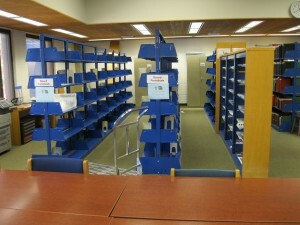 Study space, computer access, and assistance finding books are all available on the main level. 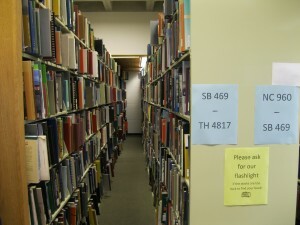 Please don't hesitate to ask us if you have any questions or need help locating our resources. 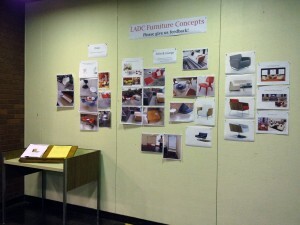 For more frequent updates on our progress, check the LADC's Facebook page. 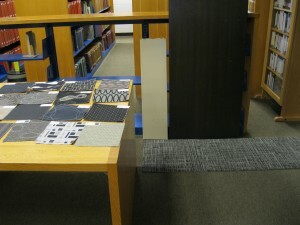 Fabric samples and images of furniture are currently displayed in the LADC (look on our entryway bulletin board and around the first floor). Feedback is welcome! A notepad is available by the entrance if you'd like to write comments or recommendations. You can also view our color choices for paint, wood stain (for staining shelf ends, study tables, and wooden chairs), and carpet. 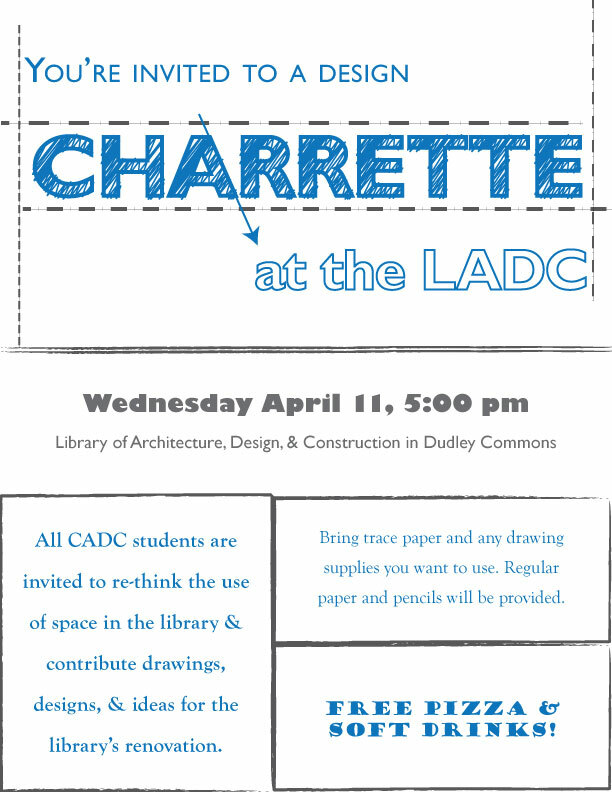 During the charrette at the LADC, students from the College of Architecture, Design, and Construction contributed hundreds of suggestions concerning their priorities for the renovation of the LADC, including the submission of floor plans for the rearrangement of the LADC, and votes for their carpet, furniture, wood stain, and fabric preferences. 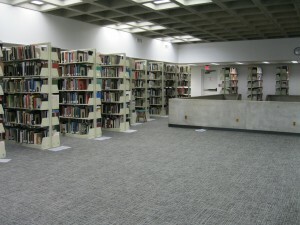 In response, the library's renovation will emphasize differentiated spaces with designated collaborative and individual study areas, an updated color scheme, maximization of natural light, and new furniture and carpet. 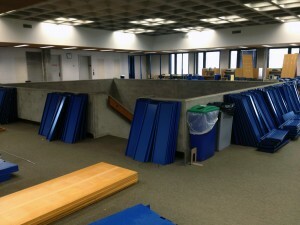 The renovation will be completed during the 2012-2013 school year. 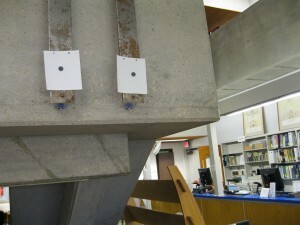 Phase 1 (upstairs) begins this summer, and phase 2 (ground floor) will follow in December.